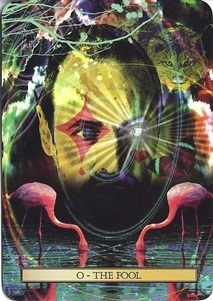 The Son Tarot (Mysticism, Meditation and Divination for Gay Men) is a new publication from Christopher Butler and Schiffer Books. As a straight woman, this deck is not targeted to me, but I thought I'd share my thoughts and give you some of the specifics of the deck. Get to know yourself through these astounding self-realization cards. Each inspirational image represents an aspect of gay male living. 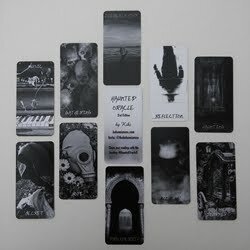 Whether you use them singly for meditation or as part of a Tarot spread for divination, this deck will be a gateway to your higher self or an exciting path for exploring the spirituality so many gay men crave, free from the prejudices of established or formal religion. 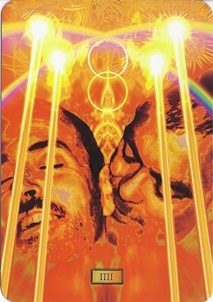 Created by a gay man, for gay men, The Son Tarot celebrates who we are and all the richness that entails." The cards measure 3.5" x 5". The reversible backs are lovely, featuring a black background behind color streaked silhouettes of two men (see below). The cards are made of thick, glossy Schiffer cardstock. The deck is housed in the familiar Schiffer way, in a beautiful magnetized flip up box, with slots for the deck and book. 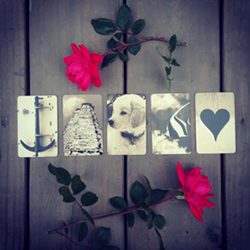 The cards are comprised of a collage of photographs and symbolic imagery. The Majors are titled and numbered. The Minors feature only a Roman Numeral on each card, with the exception of the Aces and Courts, which have the full titles printed on them. Instead of Pages, Knights, Queens and Kings, the courts in this deck are titled respectively: Herald, Knight, Prince and King. I'll share some of my thoughts on the cards that stood out to me most. The deck begins in a beautiful way with the colorful and fanciful Fool. The face is transposed with shapes so that he looks painted as a clown. One of his eyes sparkles so brightly that there are white rays coming from it in all directions. There are branches above, clouds and a bobcat (?) behind, a butterfly to the side, water below, and two flamingos front and center. In the Five of Swords, I think I have experienced a first in my tarot world. There is a guy giving the finger to someone. This was so unexpected it made me laugh. But doesn't that just fit the vibe of the Five of Wands which certainly has a "screw you" aura about it? Fantastic. The Three of Swords, on the other hand, didn't fit for me. I associate this card with heartache and drowning in tears of sorrow. The guy in this card is screaming, and it looks more like extreme frustration or anger to me. 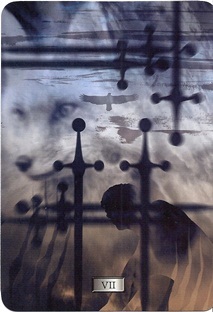 The Seven of Swords is beautiful with its grey tones and the gorgeous fox in the background symbolizing the slyness of this card. In the Six of Swords, the head of a man morphs with a swan which really captivated me for some reason and drew me deeper into the feeling of the card. The Ten of Swords is powerful in its subtlety. At first glance, you notice the swords lined up in the background, then you see what lies beneath the sword in the foreground. There is the barely visible face of a man under the water, having been punctured in his chest by the sword. But you don't see his chest, only a darkness in the water surrounding the sword, insinuating blood. Great card. Some of the Wands cards (Ace, Six) are a little busy, the patterns and mixed visuals making it hard to focus on what's supposed to be represented. The Four of Wands is a card that I relate to marriage and the home. The card in this deck is lovely, with two male faces, one nibbling on the other's ear while the latter smiles... a lovely visual of gay marriage. I like the Six of Cups a lot, where we see a man looking into the distance, and at the top of the card is a military photo of a man with a dated postmark stamped on it. It really gives the feeling of remembering. The Ace of Pentacles is very earthy. It's colored in muted greens, and we see the top half of a man laying down, with the grass, sun, trees, and Earth all floating in the background. The shape of a pentacle is laying on top of the entire background of images. It is such a peaceful card and makes me feel like meditating. Of the Court Cards, a few stood out for me. I really like the giant Club symbol that frames theHerald of Wands, and the nod to the Queen of Wands with the sunflowers in the Prince of Wands. The Knight of Cups literally holds a heart in his hands, at the level of his own heart. In the muted coloring of the card, the pink color of the heart really stands out, although a close look at his facial expression gives me the feeling that he is majorly put out. He's looking right at me, and he does not like me. At. All. I might go so far as to say he hates me. And I don't know why. Odd sort of feeling from this Knight. And one more random note. Some of the photographs look very much like Kevin Kline to me. I normally don't like tarot cards that look like celebrities, but in this case it appeals to me. The accompanying book is 207 pages and it is fantastic. The author really goes into the imagery and meaning of each card. It's a delight to read. The author is very personable, and he relates the cards to real life examples of living a gay life. Reading it feels like a friend is talking to me. The explanations of the Court Cards are ingenious. For each member of the court, the author examines them in various ways: as an elemental force, as a role model, as a lover, as ourselves, and as a shadow character. This is such a wonderful idea, especially for those new to tarot, as it helps you explore different sides to each of the court cards, and get to know them as multi-dimensional men. 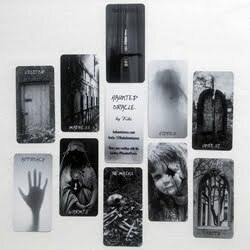 At the end of the book, there are some ideas on working with the cards for things other than readings. This includes three awesome visualization exercises using the cards (one I had never thought of before and will certainly be trying for myself), telling your story with the cards, and sharing with the cards (exercises to do with other people). 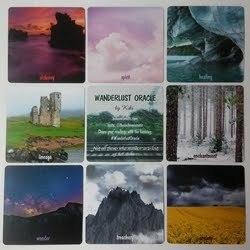 The book ends with three spreads: The Celtic Cross, The Six-Card Challenge Spread, and The Three-Card (past-present-future) Spread. There are two lined pages for notes at the end. I'm not a gay man, so my review can't encompass all the feelings the deck is meant to invoke. However, I can tell you that it's a lovely deck, art-wise. There is nothing in the imagery that will offend a modest querent. It's both gentle and strong, masculine and feminine. And I think it's a great addition to the tarot world, where there are so few decks geared toward the gay community. How annoying it must be to always see straight couples in the cards that don't represent your own love life. 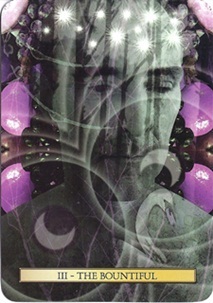 Kudos to Christopher Butler for his contribution to the tarot world, and to Schiffer for publishing it. See below for more card images. Deck: The Son Tarot (by Christopher Butler, published by Schiffer Books). 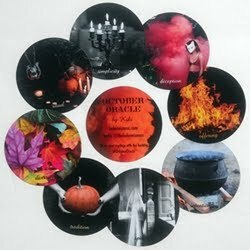 This deck review was originally published on my previous blog (Tarot Dame) on 11/3/12.